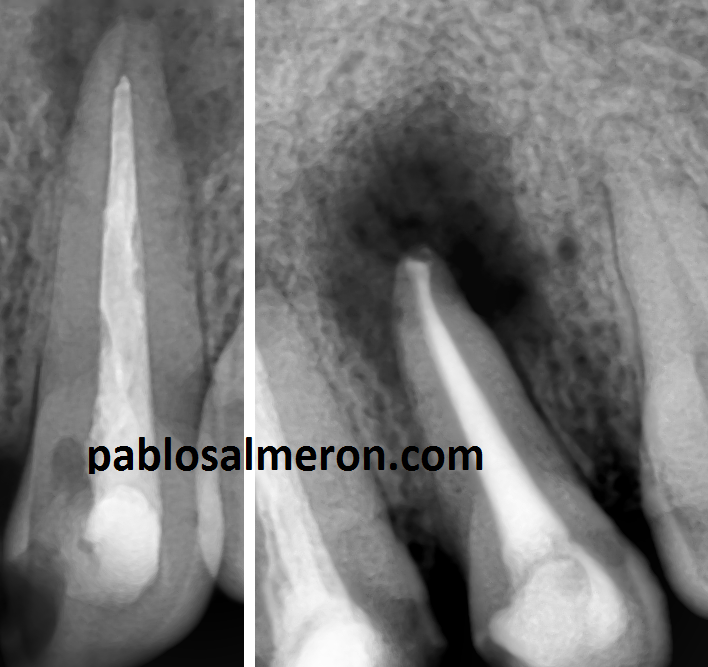 This is a re-treatment of an upper second molar #27 through an Emax crown . These kinds of treatments are difficult. However, sometimes they can be easy, and other times they can be impossible. The re-treatment of the tooth depends a lot on the work carried out by the previous dentist therefore, I endeavour to be honest with my patients, as sometimes I am not able to fix everything. In the following case I had to re-treat a tooth filled with Thermafil. 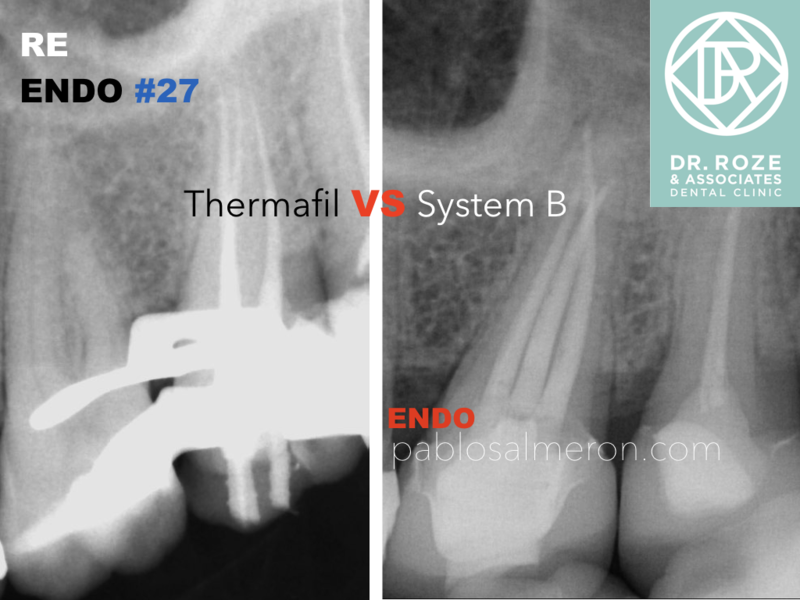 Although Thermafil is a great system and works very well in the hands of some endodontist, it doesn’t work for me. I feel that I can’t control the obturation in 3D and the plastic carrier can be easily exposed without guttapercha around. For that reason, I feel much more comfortable and secure using vertical condensation with System B, it requires maybe more training under the microscope but is worth it and works really well for me. “Never give up, because when you think it’s all over, is the moment where everything starts.” — Jim Morrison. At Dr. Roze & Associates. Dubai. Abu Dhabi. UAE. En este vídeo os muestro parte de una reendodoncia de un primer molar superior (16) a través de una corona de metal cerámica con un muñón metálico y un poste en el conducto palatino. Lo que veis en el vídeo es el momento en el que consigo quitar el poste utilizando ultrasonidos. Recomiendo ver en 720p HD. 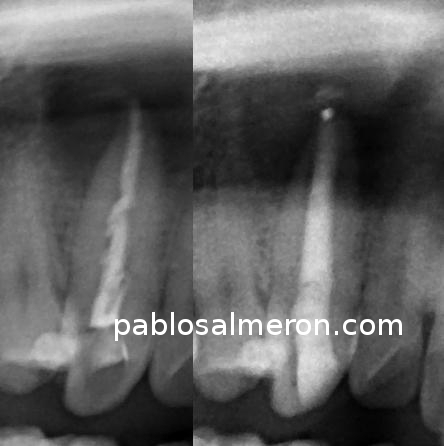 – Reendodoncia de primer molar superior. 16. – First upper molar retreatment. Root Canal post removal. – Upper lateral incisor retreatment. – System B guttapercha system. At Buckle Advanced Dental Care in Liverpool. 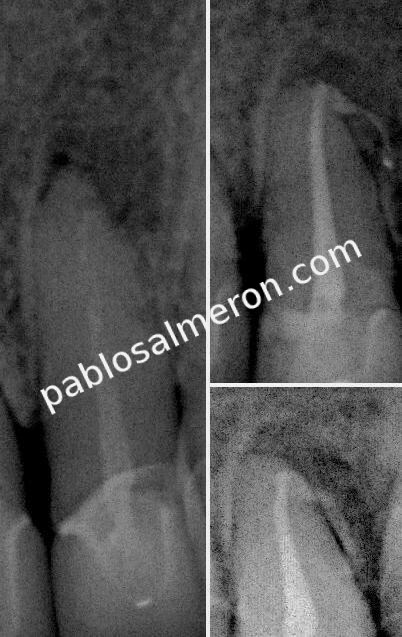 Para este caso tuve que permeabilizar el ápice bastante porque la endodoncia anterior (las puntas de papel) estaba pasada. El resultado fue un ápice abierto el cual obturé con MTA, y el resto del conducto con gutapercha caliente con SystemB.